What you see, is not always the reality. Reality, sometimes, shields itself under the layer of superficial realism. Some things that we don't often appreciate, are the ones that we don't notice as a part of our routine life. Many people find it difficult, rather impossible, to survive through the glances of hardship. But the important question is, is it always about the first impression? Can it always be the last chance to get someones attention? Does it have consequences that would impact the lifetime? It will always be about the courage, irrespective of the expectations that one always had. I recently read Glimpses, a book by author Dhruv Sharma which is a collection of 23 short stories across various aspects of our very day to day life. It is wonderful to see how Dhruv beautifully penned these aspects in this book coupled with fiction and equally great display of emotions. The Cover of the book is as simple as the stories in the book and yet stands out along with the overall thought of the book, which mostly is about the individuals and their surroundings, their people, their wishes and their life at large. 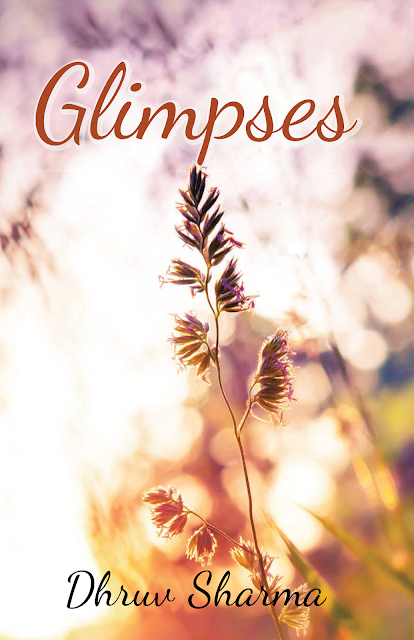 The stories in Glimpses by Dhruv Sharma are a sign of one's ability to imagine and then present the same to the readers, you can call it fiction, but the choice of words adds elegance to it. When you start reading the stories you will find simplicity of the narration bear-hugging appeal and unreal yet delicate plots will melt your heart in some stories like "The Bus Ride". In this particular short story, you see the excitement of meeting someone, the longing to be together and the pain of separation. You will also come across what kindness is and how your simple measures can keep hope alive. Though fiction, it tells a tale worth a message. Similarly, almost every other story puts forward a logic, allows you to speculate and then connect with the characters. Some of the other stories that I personally liked from the book are "Contract", "Casanova", "The Birthday Card". In between certain stories, you may find characters intersecting each others, thoughts collapsing, but then these are short stories. Overall, the book is very much about the positive aspects of our everyday life which we miss under the pretext of those first impressions, not understanding the depth in the hurry to be very much conclusive. I will recommend this book to anyone interested in reading fiction, short stories and also if you are looking to read something refreshing and new. Well reviewed.nice to see the appreciation received for the efforts and hardwork put in by the author in last 8-10 years .